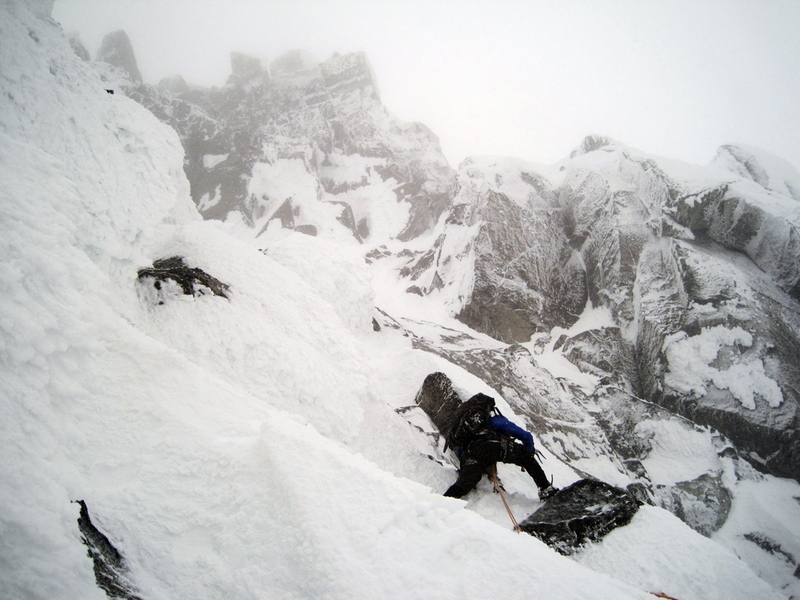 Climbing the couloir was the easiest part of this 33-hour adventure, which involved rime ice on Class 5 rock, high winds and white-out conditions, a great bivy spot in a cave with a fire, and a few thousand feet of extra climbing. Mt. Stuart at its best. Approaching Mt. Stuart. 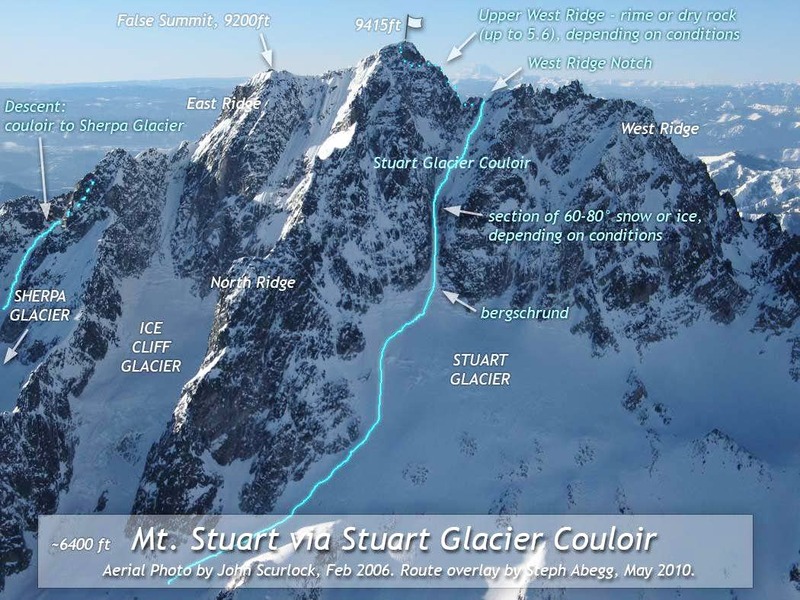 That's the classic north ridge in the photo, which we climbed around on the right (via the Stuart Glacier) to get to the Stuart Glacier Couloir. We left the Stuart Lake TH at 4:30am, so it took us 3.5 hrs to get to here. 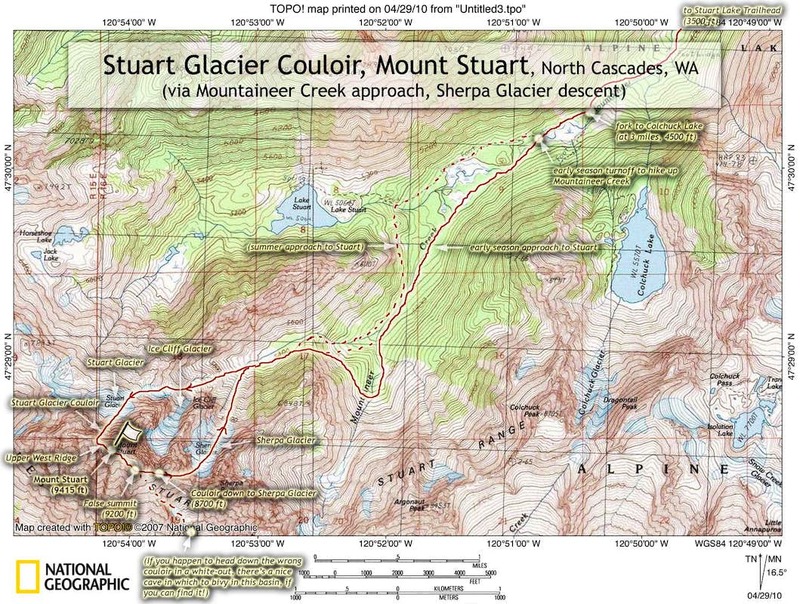 Looking up the Stuart Glacier Couloir. Not the greatest weather, but it was forecasted to improve by midday (which it never did). A thin snowbridge covered the bergschrund at the base of the couloir. The bergschrund is often problematic, and is quite deep. We finally found a location we felt we could cross, and belayed each other across. Tom topping out at the West Ridge notch at the top of the couloir. The conditions in the couloir were mellow, no water ice, and we did not set any protection (we were roped up, but that was more for the bergschrund crossing). 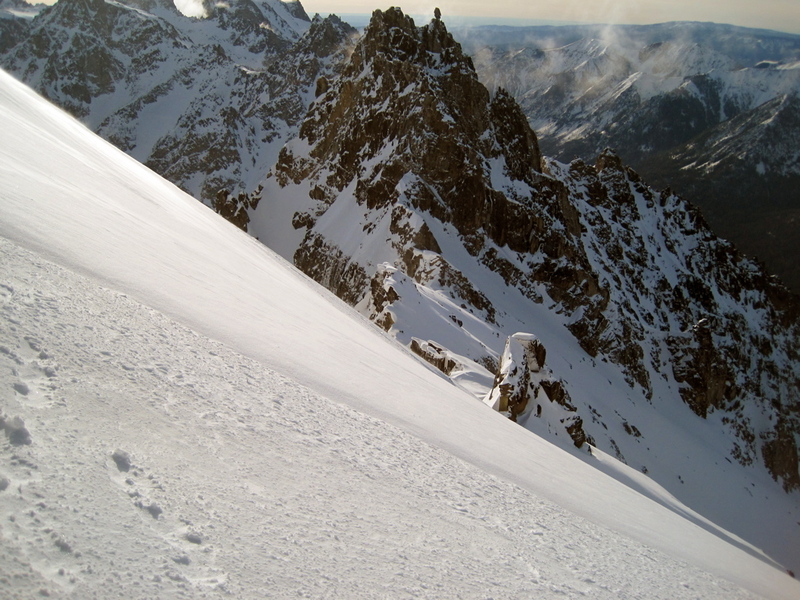 It took about 1 hour to climb the couloir. In retrospect, the actual couloir was the easiest part of the whole trip! Tom ready to go on the upper west ridge that brings you to the summit. 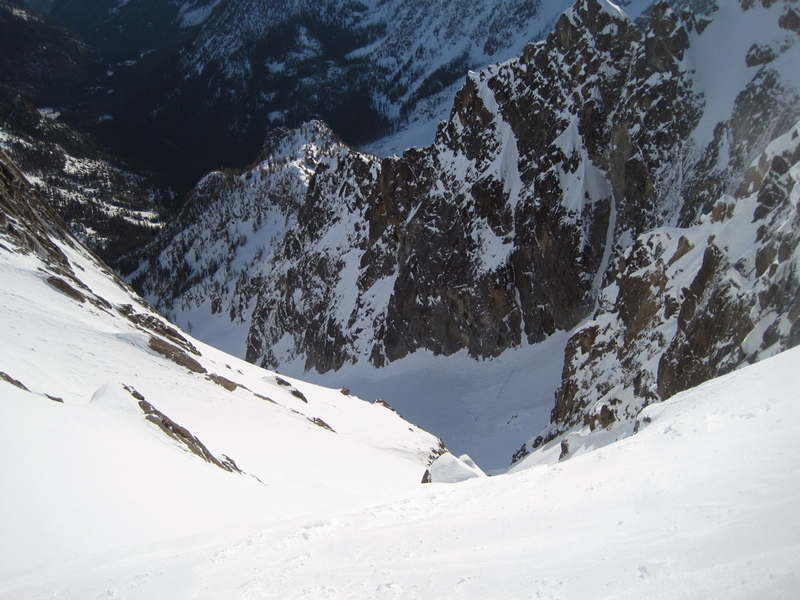 I had led the couloir, and Tom took the leads on this section, which turned out to be very challenging mixed terrain with the rimed conditions and high winds. 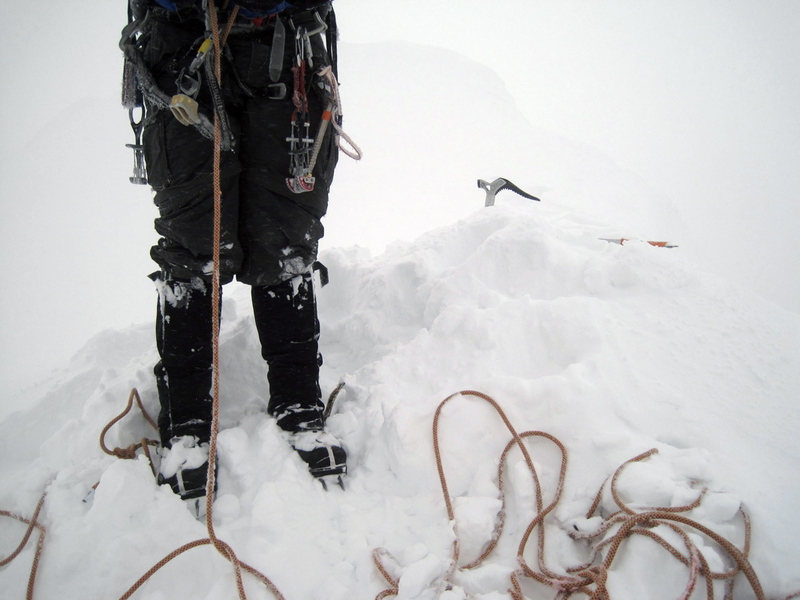 We encountered very challenging mixed climbing conditions on the summit pyramid. The route up the summit pyramid from the West Ridge notch typically follows the upper 6 pitches of the west ridge route (5.6). This was the toughest mixed climbing I've done, and Tom did a spectacular job leading it. This is Tom's summit photo with a point-and-shoot camera that lacks the wide angle I am used to with my SLRs I normally take with me. 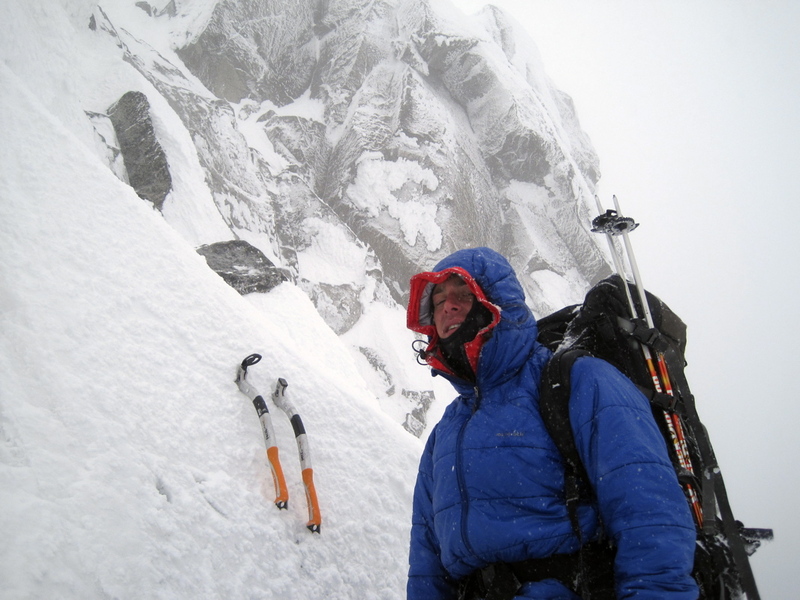 It took about 5 hours to climb the summit pyramid with the challenging conditions and weather. This photo is of the view to the south of Mt. Stuart of the Ingalls Creek area. Our planned descent route was the Sherpa Glacier. However, visibility was so poor on the descent down the east ridge, and we were pushing the clock to get down before dark, and we mistook an intermediate SE rib for the east ridge. When we dropped into this basin the weather began to clear, and we realized our mistake. 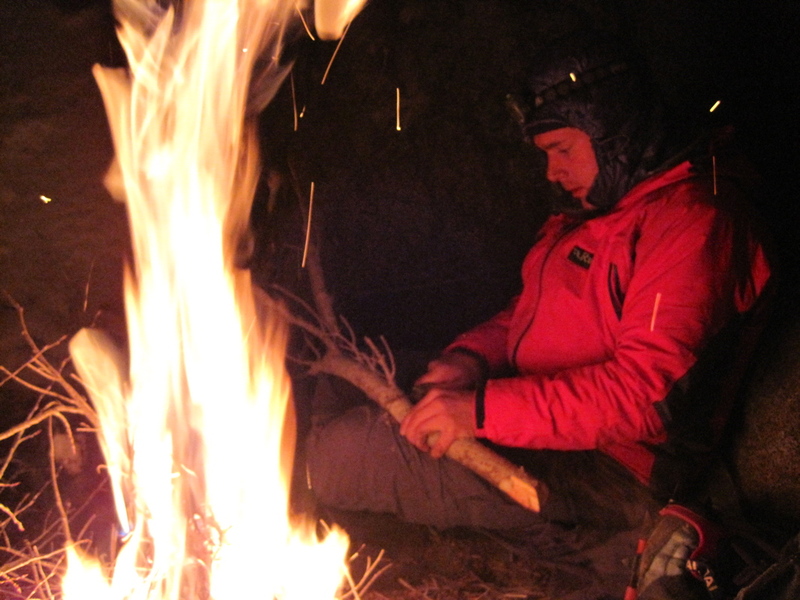 However, at this point it was almost dark and weather was still bad on the upper mountain, so we decided to bivy until dawn. We needed to find somewhere we could survive a cold and windy night. A photo of the cave under a boulder. The cave was roomy and dry. A night in the mountains beats a warm bed any night. We enjoyed a pretty morning as we slogged 3000 ft back up from our bivy to get to the east ridge of Stuart so we could descend the Sherpa Glacier on the other side.This photo was taken looking southward at the Ingalls creek area. 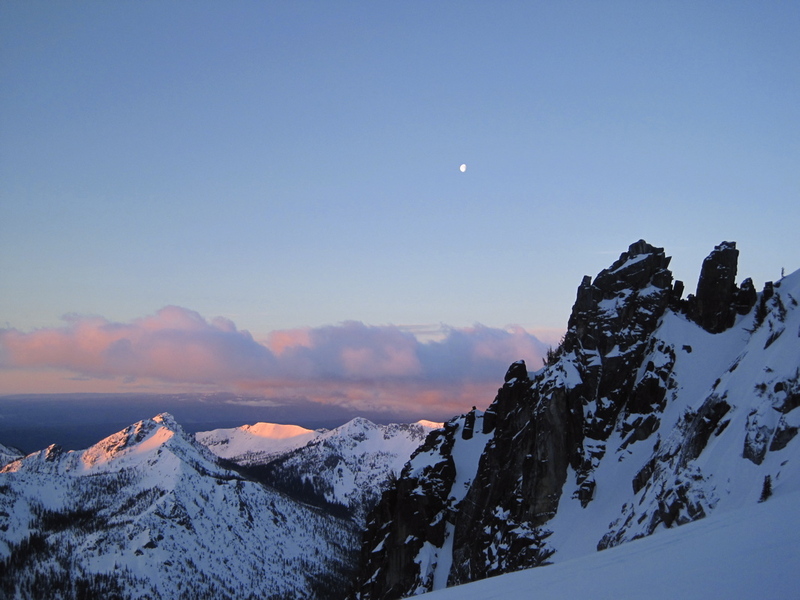 Morning sun over Sherpa Peak, with Sherpa Balanced Rock evident. 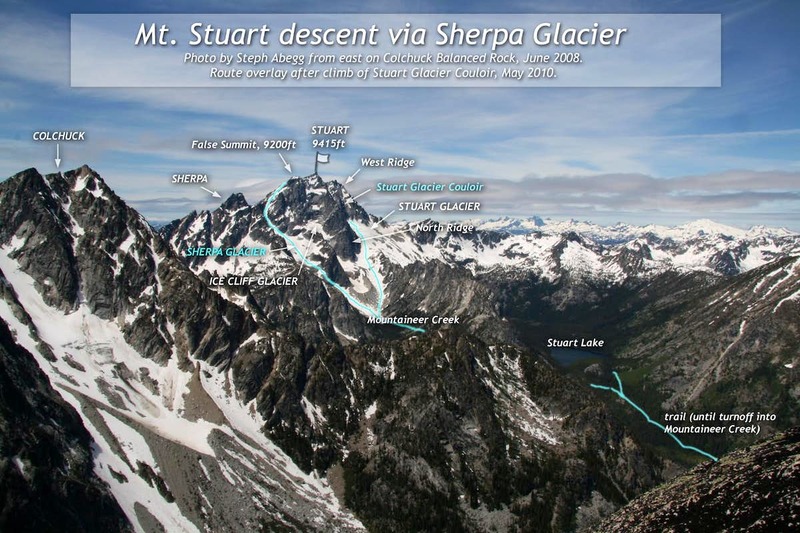 Sherpa is just east of Stuart. We had to re-gain 3000 ft to get from our bivy to the east ridge of Stuart. Now that we had visibility, we easily found the couloir leading onto the Sherpa Glacier. 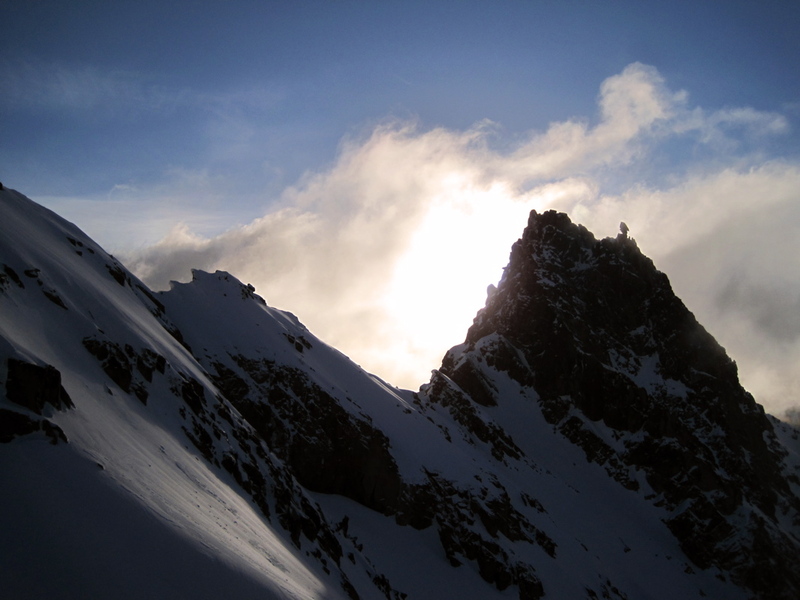 This couloir starts in the center of this photo, just left of the rock group. A rock spire on the east ridge above the Ice Cliff Glacier (this is on the ridge above the couloir entrance to Sherpa Glacier—I had ascended too high in order not to miss the couloir to the Sherpa Glacier, shown in the next photo). Note the crack in the snow—that's a cornice that's going to slough off soon, hopefully not when climbers are below. Whoever walked across the top was lucky! Looking down the east ridge. 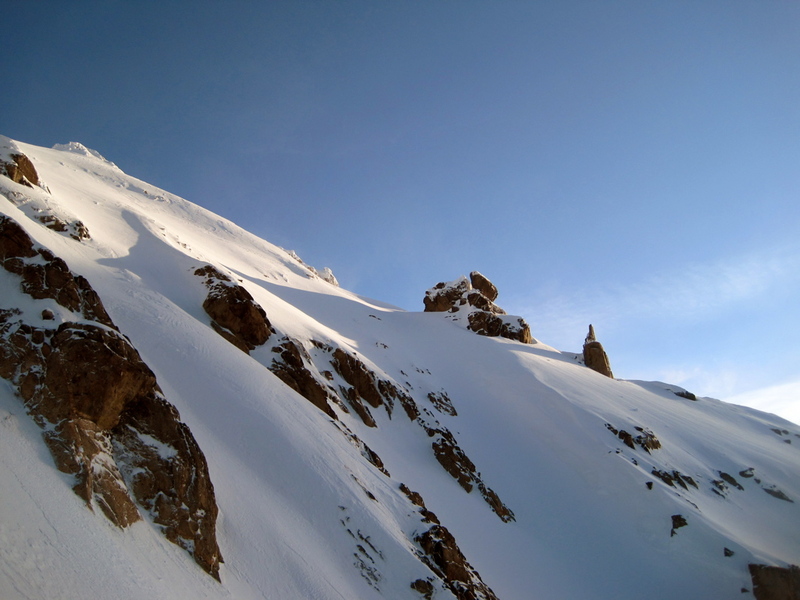 The rock spire marks the entrance to the couloir leading onto the Sherpa Glacier. Looking down towards the Sherpa Glacier descent. This was a pretty quick and easy descent back to the base of Stuart we had approached from. 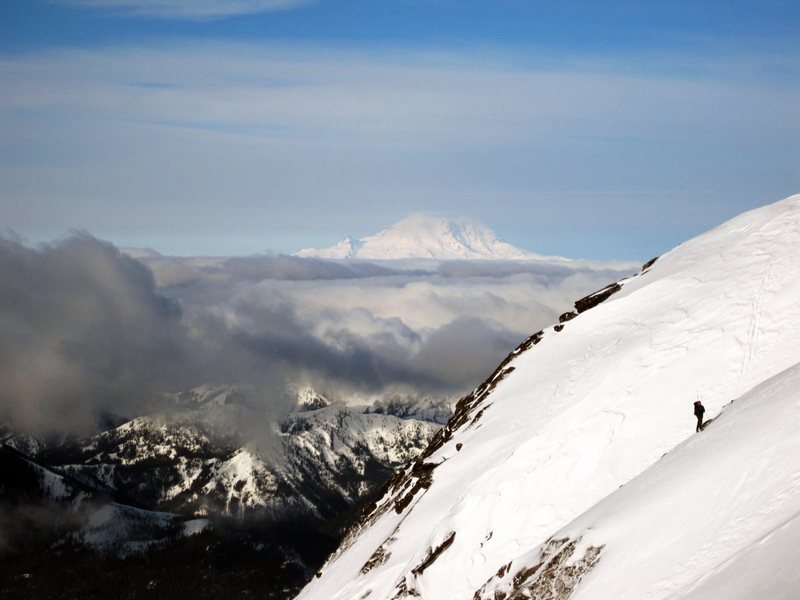 Tom traversing from the SE rib to the East ridge, with Mt. Rainier in the background. It was almost worth the overnight bivy to have some views, since the previous day had been so socked in. Taken from the Mountaineer Creek drainage during the hike out. I don't think these peaks have official names, but might be marked as "Mountaineer Ridge" on some maps. I finally got around to climbing this gem on Saturday. Steph Abegg and I met at the Mountaineer's Creek TH on Saturday morning at 4AM. We were able to drive to within 1/4 mile of the trailhead in high clearance vehicles. Another climber was supposed to join us there, but apparently he got stuck in the snow about 1 mile from the TH. We left the TH at 4:35 under cloudy skies. 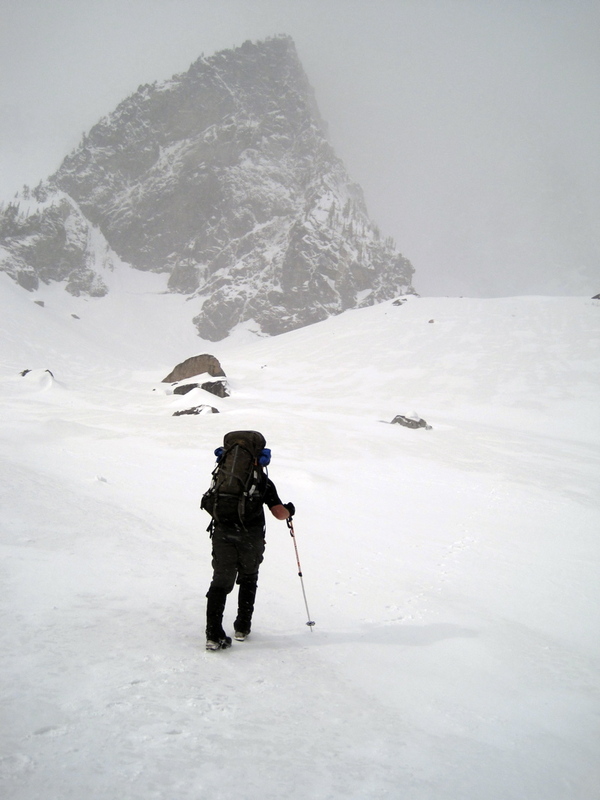 We put on snowshoes immediately, and wore them all the way to the base of the route. 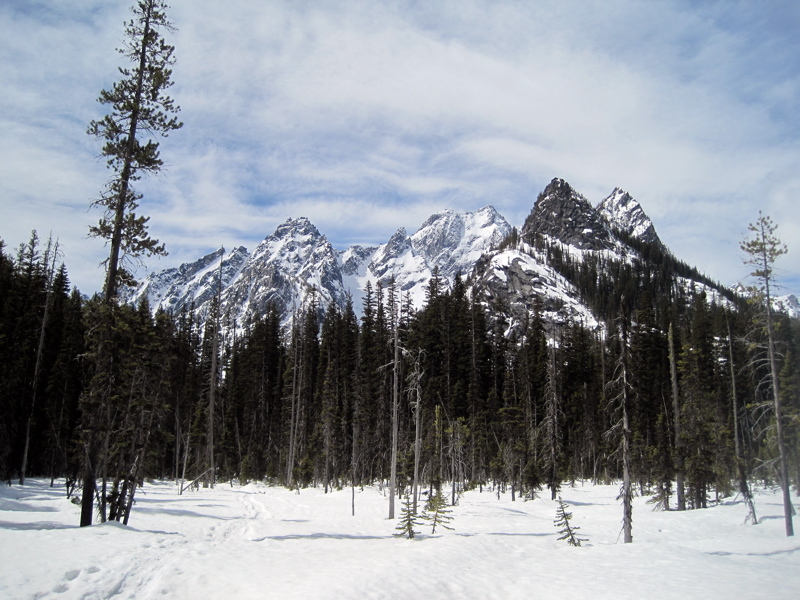 The trail to the Colchuck Lake junction was fairly well-packed, but the snow beyond that was soft. We arrived in the basin below the route and saw three climbers making their way up the Ice Cliff Glacier. We stashed our snowshoes by a big boulder in the middle of the basin and headed off. 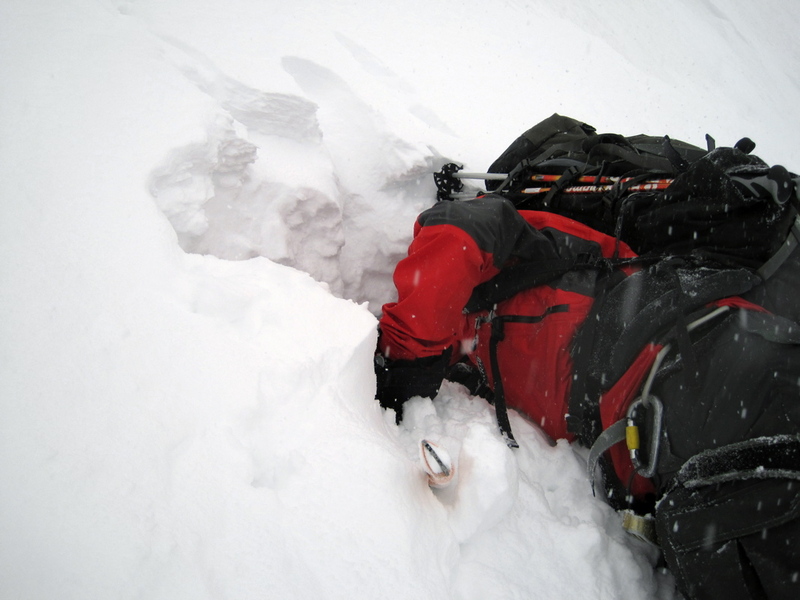 The snow here was perfect with a walkable crust in places, sinking up to ankle deep in others. As we ascended, the winds (out of the NW) steadily increased. We stopped at the 'schrund and looked for a good spot to cross. The snow here was sugary and light, and we found it tricky to find a place to cross safely. We belayed across the bergschrund without incident. The rest of the couloir to the notch in the W Ridge was very straightforward (snow to 55 degrees). We were disappointed to not find any ice. 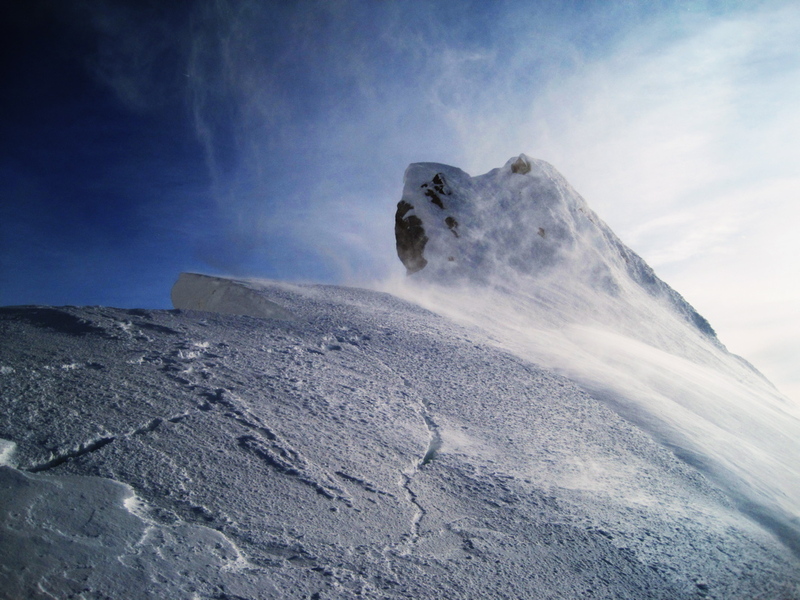 The winds were ferocious at this point, and spindrift was a nuisance. Visibility was very limited (20 feet?). 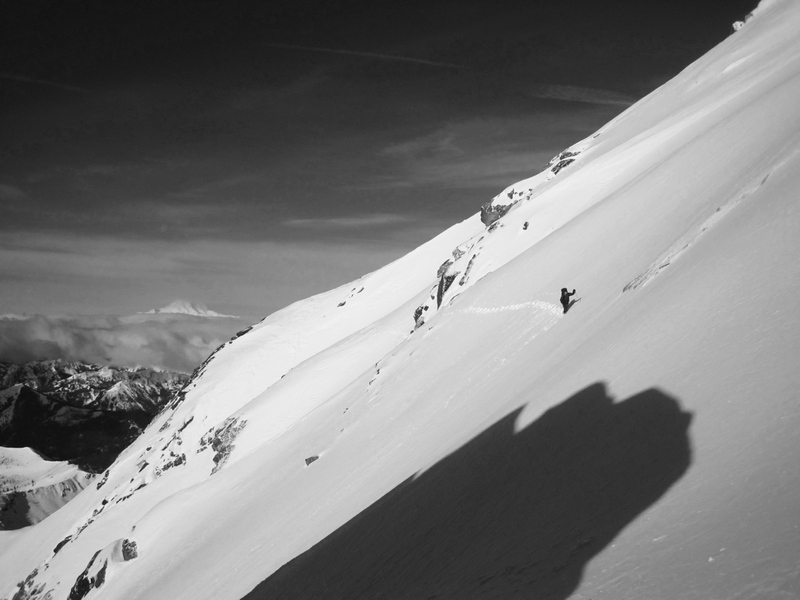 But what the couloir lacked in ice, the W Ridge sure made up for it. The entire way from the notch to the summit was completely caked in ice and snow (much of it rhime). This provided challenging conditions for the mid fifth class rock. The first pitch from the notch went up a short, vertical rhime mushroom. The perch atop it was airy, and there was no reliable pro, so we belayed each other up off a solid belay. From here, we traversed the extremely exposed rhimed up ridgecrest (again, little to no pro). We tried to use natural pro where available, as this was all we could find in most places. We came to the 5.6 lieback and, no surprise, it was caked in ice (the rock was totally plastered). We decided to bypass this by doing a delicate traverse across the upper N Face. Again, pro was sparse as cracks were filled with ice and snow. Pitons came in handy for belays, and I was able to place a few cams (4 total on the rock pitches). 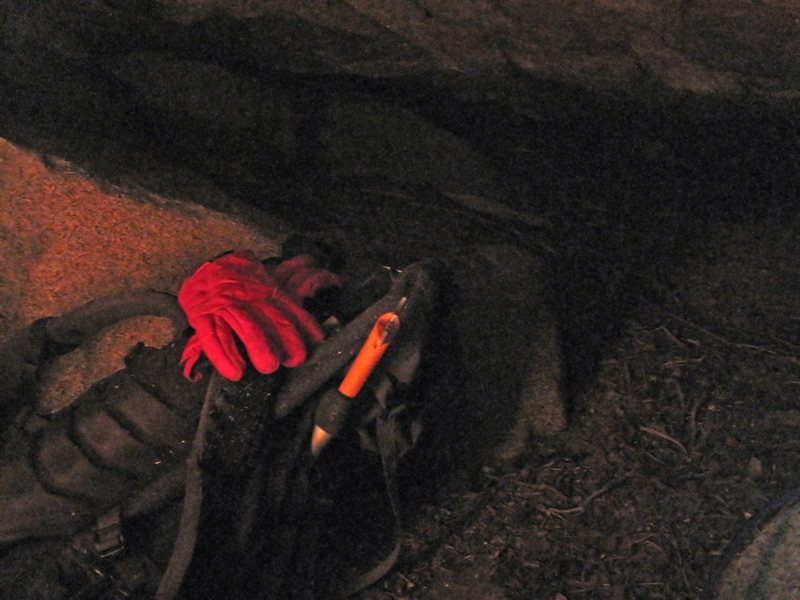 We were using a 30m rope and we belayed 6 pitches of very exciting, very exposed climbing. The summit block was one big rhime mushroom - no rock could be seen. 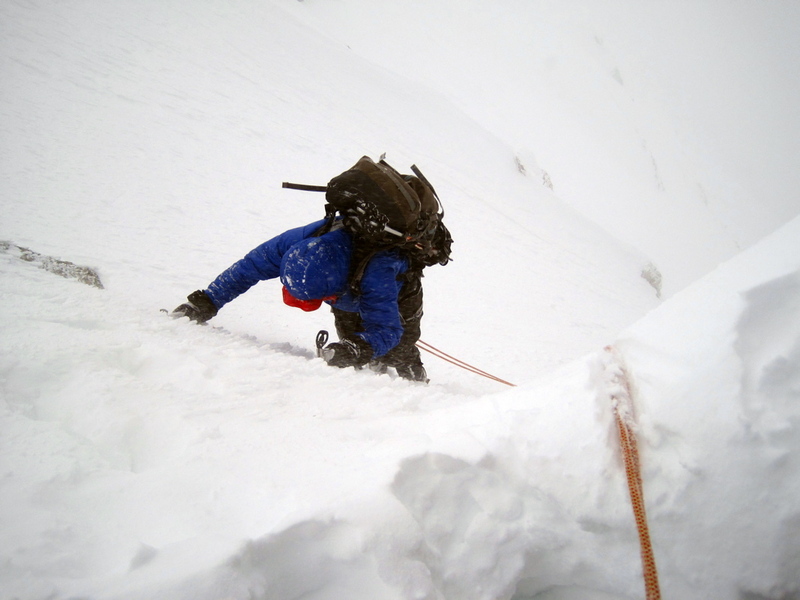 To climb it involved a delicate traverse along a downward sloping, icy rock ledge (in crampons) pushed outward by bulging rhime (no apparent pro). I chopped at the bulging rhime for 5 minutes in an attempt to create a wider ledge. My last piece was 20 feet below me and about 10 feet to my side! I belayed Steph up from the summit at 6:30. The climbing was very time-consuming, and we had to hurry to get down before dark. 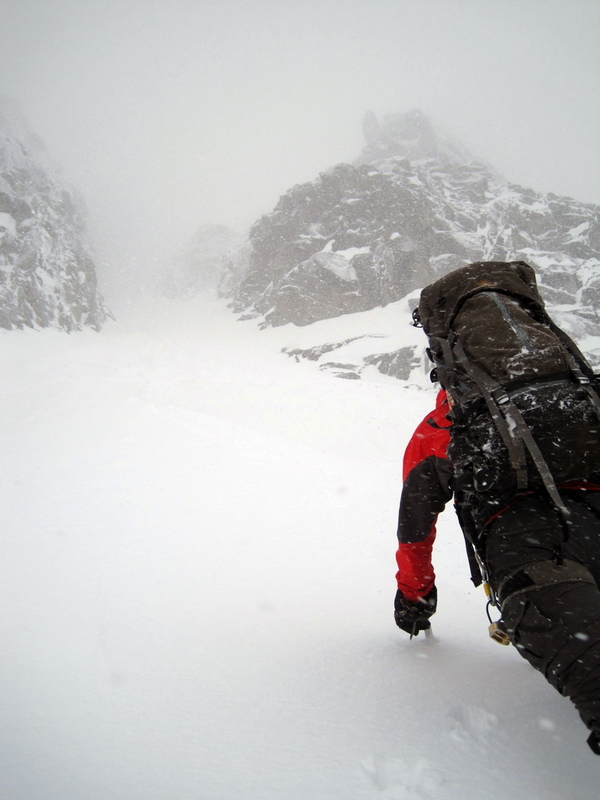 With winds still howling wildly (steady 25, gusting to 40+), sideways snow pelting us in the face, and visibility at about 50 feet, we down climbed towards the false summit, in search of the Sherpa Glacier (our descent route). Accurate routefinding was nearly impossible. A mini-epic ensued. An excellent climb with an excellent partner.